What do the words “sorry” and “no” have in common? Most women say men have a tough time saying both, especially in certain situations. Guys find it difficult to apologize to their girlfriends when arguments are blown out of proportion. And when it comes to barkada, guys just can’t say no. There seems to be no rhyme or reason to our inability to decline the call of a boys’ night out, but five common themes hold true for majority of the Pinoy male population. In response to invites to gatherings or parties we’d rather not attend, we usually say we’ll try to make it. It’s the Pinoy way of being polite. It also has to do with the Pinoy trait known as pakikisama. Unlike women who seem to have a telepathic connection with their girl friends, men abide by the rules of pakikisama, because that’s how they stay in touch with their buddies. “Dapat marunong ka makisama or else you’ll risk losing the friends you have, too,” says Richard, 31. It’s better to give (in) than to receive (flak). It encourages our independence...from you. “Hanging out with my buddies is a refreshing reminder that there’s more to life than work and responsibilities,” explains Justin, 23. Being in a relationship can take its toll on the persons involved, especially when they spend all their time together. Guys periodically need a break from that to regroup and do their thing. It’s our way of breaking the monotony and keeping our own lives interesting, so you don’t end up getting bored with us either. Guys are like wolves—we roll in packs. So from time to time, we’d like to just be with our friends, reminiscing about good times, or just catching up on what’s been going on in our changing lives. “Minsan kasi, gusto lang namin lumabas kasama ang mga kaibigan namin dahil gusto lang,” says Alan, 35. But we know well enough not to say yes to every beer-call, because your feelings are ultimately more important than anyone else’s. If your guy regularly ditches you to “hang with the boys,” then a priority realignment, aka long talk, is in order. We just need to let loose once in a while. Guys do and say guy things women will never understand. When we’re in the company of bros, we’re comfortable knowing we don’t have to worry about the consequences of the stupid things we say or do. 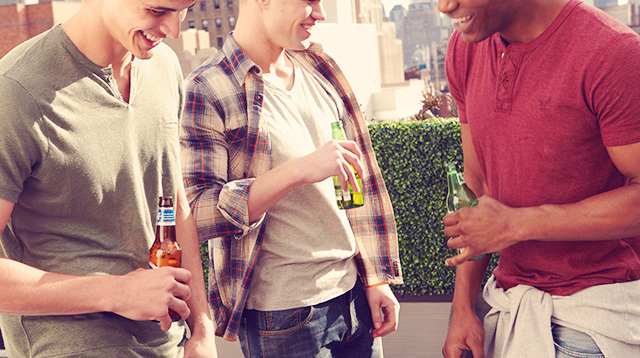 “My friends and I check out chicks a lot when we’re together,” admits Aaron, 29. “Of course, it’s harmless, just the way my girlfriend ogles guys with her friends, too.” As long as what he does with his buddies doesn’t violate the relationship rules you’ve set, then trust him and let him run with the wolves from time to time. Trust us, you wouldn’t want to be around for it anyway.